The bulk of tube style belay devices are under 100 grams. Above 100g and the devices are mostly mechanical or heavy duty figure 8’s. For belay devices, there are very few options under $15. Most manufacturers seem to aim for under $25 for normal tube devices and under $35 for guide-mode tubers. Most brake assist devices are above $50. The most commonly used belay type also called an “ATC” or “tuber.” Other than a distinction between other belay device types, “Tube” is a rarely used term, most climbers just assume you're talking about this style when they refer to your "belay device." Mostly used in rescue, canyoneering, tactical, work safety, or by old school climbers and rappellers. One reason they went out of popularity with recreational climbers is because they tend to create twists in the rope. These devices assist in stopping the rope when a climber falls or hangs on the rope. Often referred to as “auto-blocking” but that’s not the official terminology because no belay device should be assumed to work automatically by itself, even if it feels like it does (or does most the time). When simplicity is a must, or you started climbing before Tubers were the norm. Bonus: They tend to be very light weight. For rappelling, not for belaying a lead climber or top-roping. Teeth are only seen on tube devices. They add friction that helps grip the rope for more belaying control. This is helpful for belaying heavier climbers. Teeth are becoming standard on new tube devices. Teeth do wear out. You can limit wear by rappelling on the side without teeth (if you don’t need the extra friction). Once they’re worn, you’ll still have a usable belay device, just less friction. Choose "yes" for teeth only if you are looking to narrow the option of tube-style belay devices. Otherwise, choosing "yes" will eliminate other belay devices that add holding power in different ways (like devices with brake assist) since these devices do not have teeth. This is when you belay directly off the anchor instead of your harness. Guide mode is helpful if you climb outdoors a lot because it reduces the holding power required from the belayer. When your partner falls or rests, the weight of the climber is held mostly by the anchor and the belay device. When belaying in "guide mode," the tubers and plates turn auto-blocking. During a fall, the climbing rope pinches the slack rope, completely stopping the movement of either rope. A common guide mode setup shown below. There is no difference in the functionality of the device. A brake-hand should always be on the rope to ensure the climber is caught in the case of a fall. A common guide mode setup shown below. This is when the belay device significantly reduces the amount of holding power the belayer must exert to stop a fall and hold a climber. 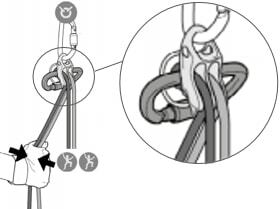 This is also called "assisted-braking" as the device must hold a significant amount of the climber’s weight; this term does not include friction-adding "teeth" found on some tube style belay devices. Confusingly referred to as “auto-blocking” or “auto-locking” these terms wrongly imply the device will always, automatically, stop a fall or hold a climber even if the belayer/rappeller is hands-free. These devices are not meant to be used without a hand on the braking side of the rope; the belayers/rapppeller brake hand should always be on the brake rope. Most of the mechanical brake assist devices only hold a single strand of rope and are not capable of double-strand rappelling (the most common method of rappel).